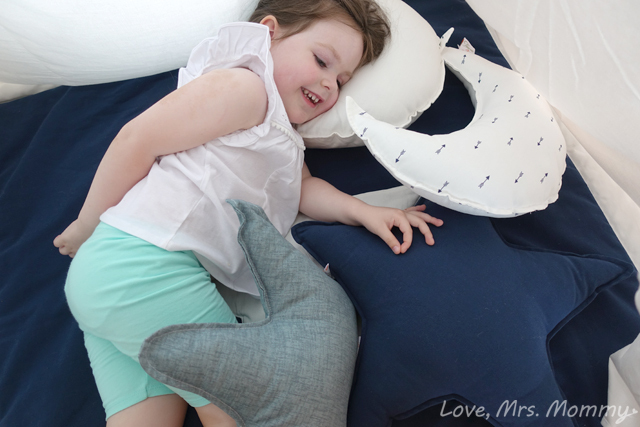 Love, Mrs. Mommy: Teepee Joy Brings Playtime Imagination to Stylish New Heights! 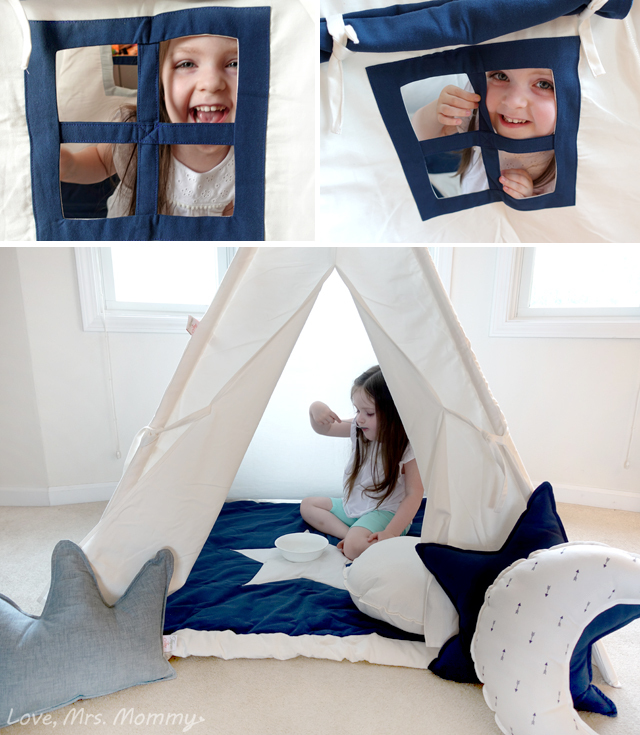 Teepee Joy Brings Playtime Imagination to Stylish New Heights! 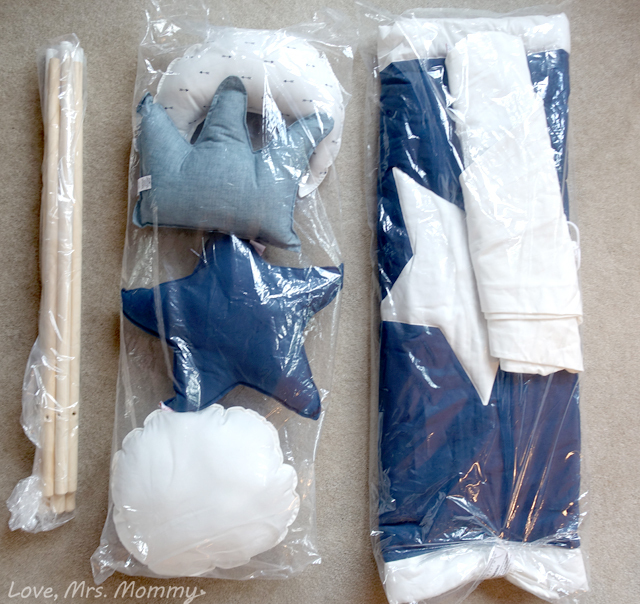 I received a Teepee Joy Set at no cost to facilitate this review. All opinions are my own. Exclusive coupon code for Love, Mrs. Mommy readers for 10% off your purchase! Just use "LMM10OFF" at checkout! Happy shopping! My daughter loves to create and use her imagination, and lately she has developed a very strong desire to make tents all over our house. (Eek!) This has turned into quite the fun time for her, but a big mess for me. Blankets, clips, chairs and even an occasional yardstick or two have been used. Needless to say, I was looking for an alternative and much safer solution to not only make her day, but to save mine as well. Hello, and thank you to the most awesome solution around… Teepee Joy! Teepee Joy is founded and run by a husband and wife team from Illinois. They got the idea when their daughters were making hideouts all over their house…. sounds familiar!! Haha! All the teepee options they found for their children either catered to kids OR adults, so they decided to do something about it. And they sure did! They designed a wide variety of fun and safe hideouts that kids adore and that parents will love displaying in their house! A win-win! Plus, they are made right here in the USA! 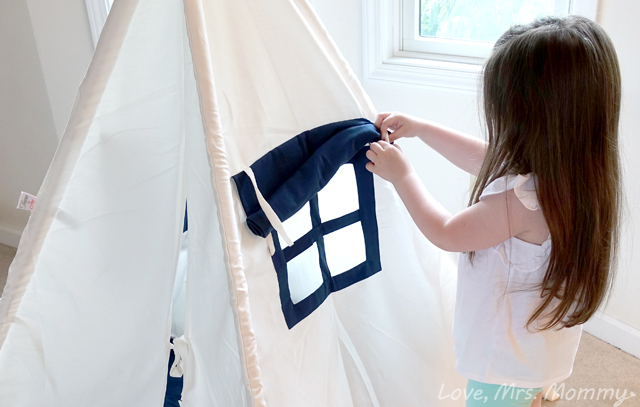 Looking through all their adorable pre-designed teepees (over 45 styles!) I had the absolute hardest time deciding on which one to get! They were all so cute and I knew my daughter would love them all. I ended up deciding on their “Whale” come to the Party Teepee! It’s classic, would work well in any room, and looked like a dreamy, magical play space. It’s also gender neutral and if you have a family of boys and girls, everyone can enjoy this fun setup! 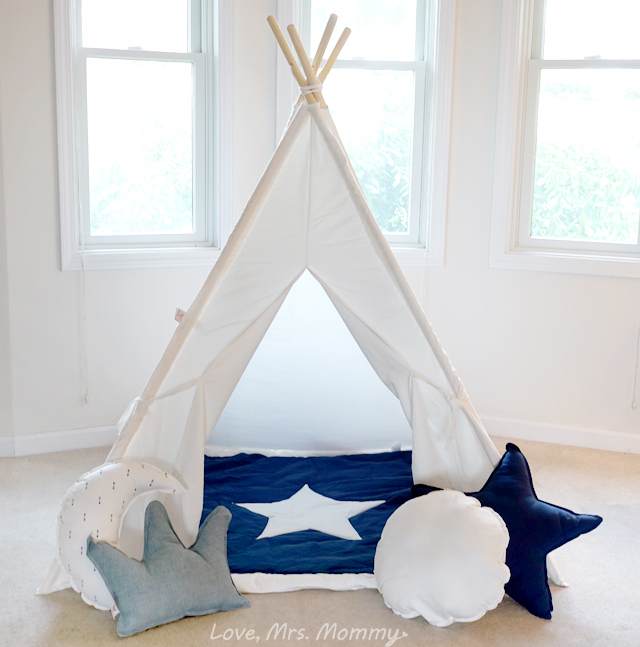 If you’d rather, you can actually customize your very own teepee for your house! Teepee Joy has hundreds of patterns and prints to choose from and you will surely find something to fit your style and home! It’s really cool too, because you can match an existing design, or even create your own unique model! It can be just the way you want! Upon arrival, everything came in one box and was wrapped and cared for nicely. As I unwrapped each piece, I was blown away by the quality! I can tell that there was much time, thought, and love that went into all these beautiful, quality pieces. Durable fabric, on-point stitching, cozy and perfectly stuffed pillows, and a well thought out design that made set-up a breeze! In fact, all I needed to do was take a general look at the instructions and then one look back to make sure everything was perfect - and it was! If you’re more of a video instruction person, they have that too! Easy peasy! Once I had her teepee, mat, and pillows all set up (my daughter was anxiously waiting in the next room), I announced that her surprise was ready and she came flyyyyying into the room! As soon as she saw everything, she lit up and shouted for joy as she ran to her teepee! I wish I had videoed her reaction as it was truly priceless! In fact, all that exploring, peek-a-boo fun, and playing got her hungry she said… so she opted to have a little ice cream treat in her new hideout! Yum! I love how Teepee Joy gives you the option to purchase all these adorable accessories for the teepee… separately, or together. Perhaps, you are only looking for a tent, then no worries, you can do just that! 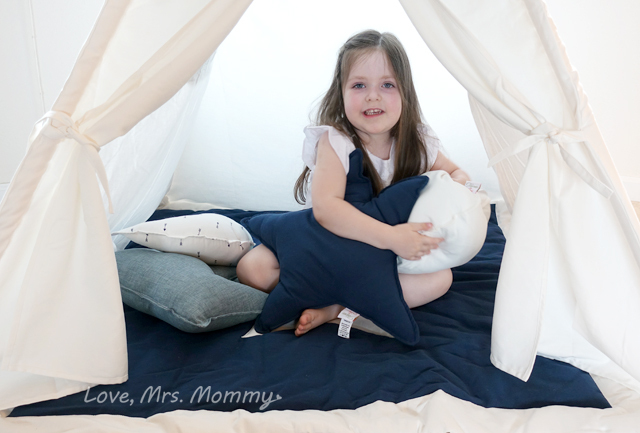 But, I will say that the mat and pillows are the perfect complement to this adorable tent and I just can’t imagine it without them! However, if you want to order a piece or two at a time, you can always do that too! Not only does my daughter adore her teepee, but so do I! Teepee Joy absolutely nailed it! They made a stylish play space that can go in any room and it appeals to both parent and child! No more sacrificing the look of your home for playtime hideouts. Now everyone’s happy and having fun! Connect: Find out more about Teepee Joy visiting their website. Then make sure you “like” them on Facebook and follow them on Instagram. Buy It: Click here to purchase the “Whale” come to the Party Teepee or check out all their other wonderful pre-designed tents here. And don’t forget about their wonderful customize options, too! Exclusive Coupon Code: Love, Mrs. Mommy readers get an exclusive coupon code for 10% off your purchase! Just use "LMM10OFF" at checkout! Happy shopping! Absolutely love this. My niece would have a blast decorating and playing in it. My granddaughters would love this. My sons had one when they were little and played in it all the time. Seems like a nice item! I'm so excited to find you. I have a beautiful new grandbaby. I hope to share many of these ideas with her. This is adorable! This would be a great addition for any kid! I have the same problem here too. My grandchildren love to make tents in my small living room. I love the idea of this tent with pillows that doesn't have to take up your whole living room. The tents look so well designed and pretty too. They would just have so much fun with one of these tents. This is such a pretty tee pee!! My kids love to play in a blanket under some chairs, so I know they would love this! I love the pillows! The different shapes are so cute! They have many cute designs! I like this set: Llamas Out There Teepee. This is so adorable! Love it! These are so cute! How wrong is it that I want the Viaje a la Luna Teepee for myself? I think my granddaughter would love this! These are adorable. I wish I could have gotten something like this for my girls when they were young, but I do have a great niece who would go nuts for a tent like this! My grandkids would love their own teepee! This has all the comforts of home! Thank you for the opportunity!! I had no idea such adorable teepees existed! I'm in LOVE! The creative play and fun are something every child could use! Thanks for your educational review! This brings back memories... Though if selected it would go to a friend that just brought a new member of their family into this world! She would surely love this as she once lived on a reservation with her grandparents as a child! As so greatly put in the statement that was first said to me when I entered 3rd grade. "Humankind has not woven the web of life. We are but one thread within it. Whatever we do to the web, we do to ourselves." Love to win this for my only nephew! He would love the TP idea for indoor or outdoor playtime! He is only 3 and this would make a great birthday or Christmas gift for him. This are really cute and look like a lot of fun for kids. This is so cute! It's exactly what I'm looking for because I'm redoing my daughters room! These are so nice! I love how unmessy they are as opposed to the traditional blanket fort. THESE TEEPEES ARE SERIOUSLY THE BEST THING EVER! I REMEMBER BULDING FORTS IN THE LIVING ROOM, AND ALWAYS WANTED MY OWN "SHELTER" AWAY FROM THE WORLD, THIS WOULD HAVE BEEN AMAZING! This seems like the perfect gift for playtime at Grandma's! What a magical teepee! My daughters would have so much fun and adore such a beautiful and fun teepee! It’s a perfect way to encourage imagination, play, and cozy reading time. Very neat! Oh my goodness, this is the cutest thing I've ever seen! Who doesn't love a great teepee? These are awesome! I think you pocked the perfect teepee for your daughter, she certainly seems to love it. It is a great quiet little area to go read or just chill out, everyone needs that on the regular. So cute. This would be perfect for our little library/office room!! This is a great design. This looks amazing and my children would have so much fun with one of these! Looks like fun! I love the pillows and the little window. These are awesome because not only are they fun but they are so cute that they add to a rooms decor instead of taking away from it. I especially love the little windows with open/close shades. Our 16 mos old grandson and his Mama, make forts together and he says "tent" then sometimes he hides in other things when he is playing and giggles and says "Tent" so I can only imagine how much he'd love a real tent like these! This is darling! My nephew would absolutely love a teepee. So sweet! Omg I totally feel you on the building tents every where and my daughter has got hurt twice in the past week. This Teepee is so cute! My daughter would love it! I love the pillows too! This is such a great idea!It could be her own little private spot to read, play and just be a kid. These are just so cute. My granddaughters would love to have one. Thank you for sharing. When my little arrives, they're going to love one of these! My son would absolutely love this!! I love it too!! My fiance and I are trying for our 4th child. Although the first three kids aren't his, he treats them that way. Bottom line is we are trying, and I'm sure our precious baby would enjoy this beautiful Teepee. Thanks for the chance!! These are a dream come true for kids!! I love these, cute and fun! I have some little ones that would love this! This would definitely be the main attraction of my daughters room! 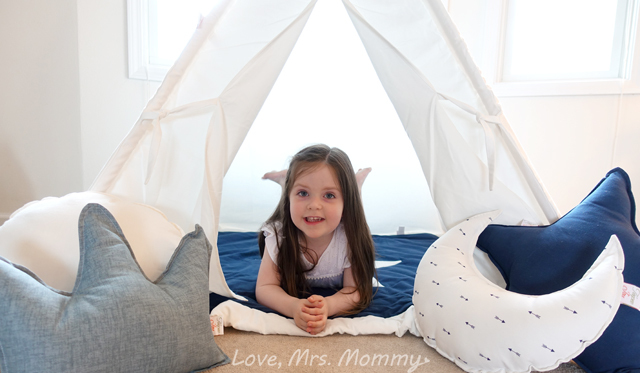 These Teepee's are adorable and any child would be thrilled to have one in their room! This looks so cute and sturdy, and the accessories kicks it up a notch. My little girl would just love to have one of these in her room. I have been looking at these for a reading nook for my girls. I haven't wanted to "splurge" yet. My girls would love to have this in their play room! How cute is this for the kiddos and for us moms how many memories does this bring back of building forts? I love these! An awesome space for a kids imagination to go wild, a quiet space to read a book or even take a nap. My granddaughters would love to have this. I know my nieces would love one of these! I think they are so cute. I really like the mat and cushions. The windows are so adorable. I would have loved one of these when I was growing up. My grandchildren will love this!! They just moved into a new house with a huge backyard too!! This woold be a lot of fun!!! Looks fun. My niece would invite her friends over for a sleep over the day she got this. When I was a kid my teepee was made with blankets and kept collapsing. This teepee looks wonderful. I know my granddaughter would love to be inside it to read and to imagine fantastic adventures. This would be so much fun! It would be hours upon hours of fun & entertainment! So fun! I've been looking at these for a long time! My three kids would have so much fun in one of these! I don't know a single kid that wouldn't though, it's essentially a super awesome fort! :) I love that they are adorable as well, so they look good in a room. This is so cool! It invites creativity and wonder. I think every child should have one. I love the little details. The Windows are just adorable. This the excellent idea for all of Baby’s and its look so comfortable with pleasures!